Solnedgång, White beach, Boracay, Filippinerna. 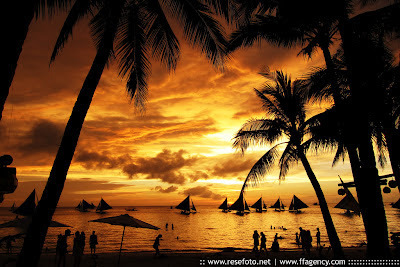 Thus, Boracay's famous White Beach, with its crystal clear water and fine white sand, has been voted in 2007 by Yahoo Travel as the most beautiful beach in the world. The two main and largest beaches in Boracay are White Beach in the west and Bulabog Beach in the east of the island.